When my boys were babies, we started using a basket to hold their shoes. Well, now they are growing bigger and their shoes are getting larger too. 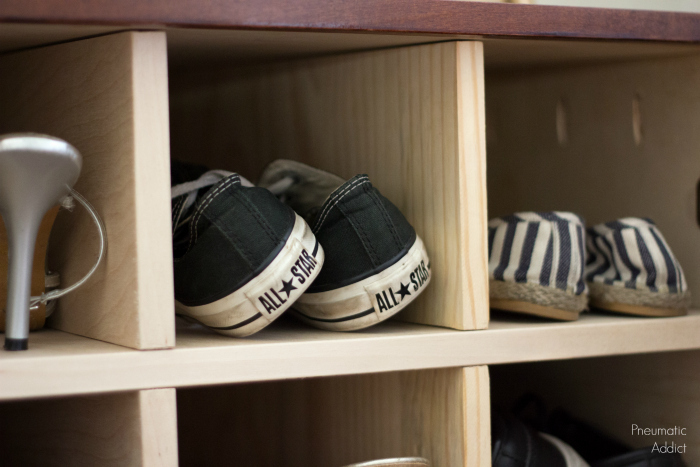 We need a better solution for shoe storage. 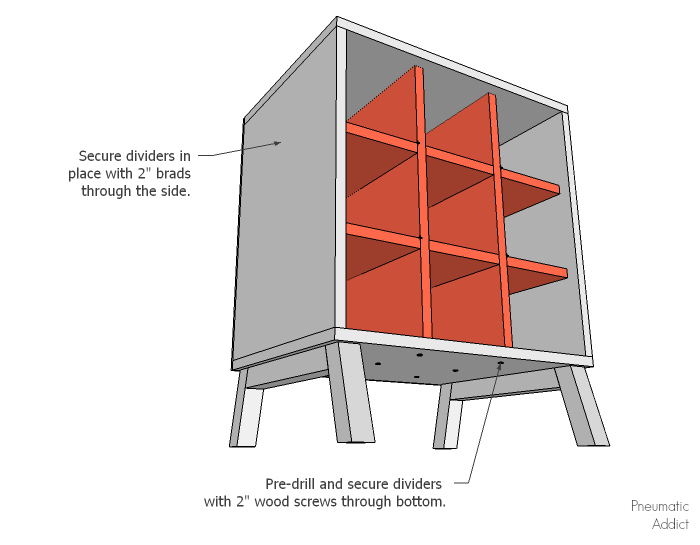 I decided I could incorporate divided cubbies in a nightstand, and it gave me a chance to try a new idea for a cabinet door that I had been brainstorming. As much as I love to build, I love to finish wood even more! I actually started blogging because I had a small business, building and refinishing furniture and wanted a chance to share the tricks I had learned. I'm always experimenting with different stains and top coats. I started stalking the Mohawk Finishing Products and H. Behlen websites about a year ago. You may not be familiar with their names, but their products are amazing and extensive! No matter what type of finishing/refinishing you want to do (wood, metal, leather), there is either an H. Behlen or Mohawk product to meet your needs. Things worked out, and instead of a restraining order, I now get to partner with these brands on my latest project. 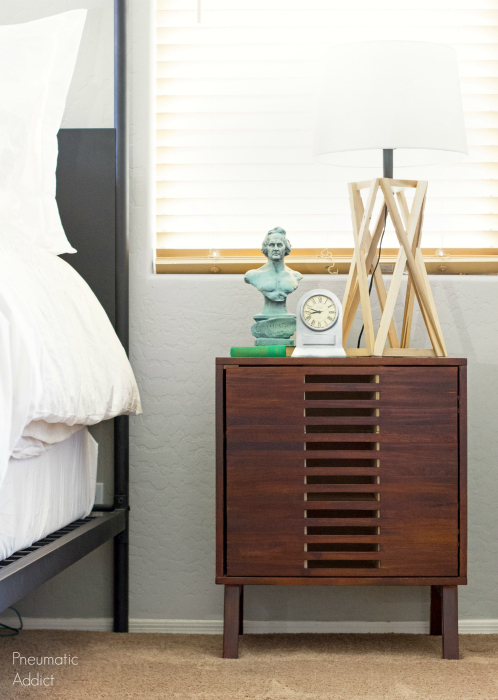 I'm working on a detailed video that shows each step I took to achieve the finish on this nightstand, so keep an eye out for that next Friday! 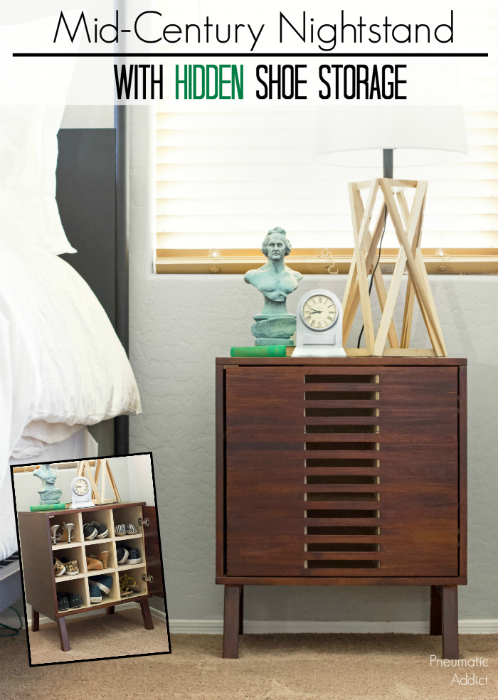 In the meantime, scroll down to learn how to build your own Mid-century nightstand with hidden shoe storage. I'm planning on hiding shoes in my sons' room, but this cabinet would be gorgeous in a living room storing wine, don't you think? (2) 3/4" plywood @ 22-1/2" x 16"
(2) 3/4" plywood @ 20-1/2" x 16"
(2) 3/4" plywood @ 21" x 15"
(2) 3/4" plywood @ 20-1/2" x 15"
(1) 1/4" plywood @ 22-1/2" x 22"
(14) 3/4" x 3/4" dowel @ 20-1/4"
(28) 3/4" x 3/4" dowel @ 7"
1. The first step is to cut all your material down to size. 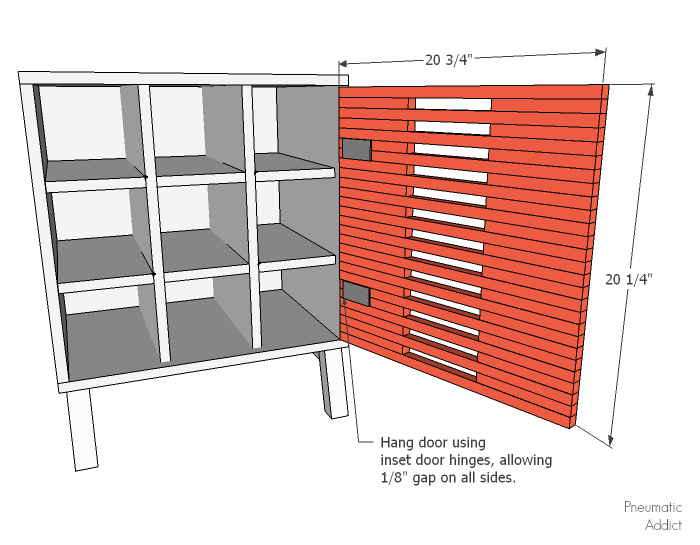 Once the plywood panels are cut, decide which edges will be exposed and *iron-on edge banding. 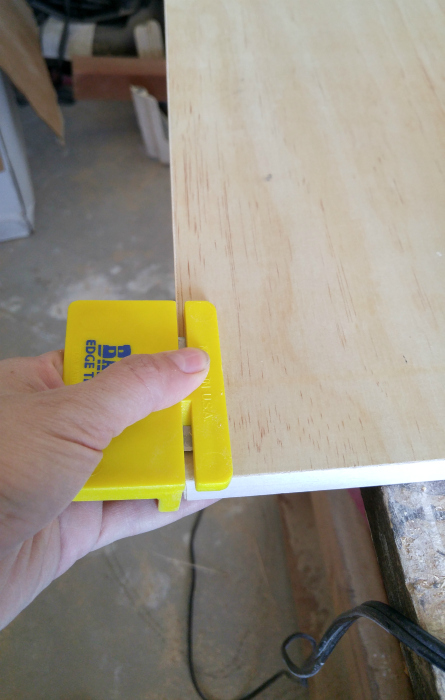 Once edge banding is applied and trimmed, a piece of plywood looks just like a solid piece of wood. 2. Drill five, 3/4" pocket holes across both ends of the 20-1/2" x 16" panels. 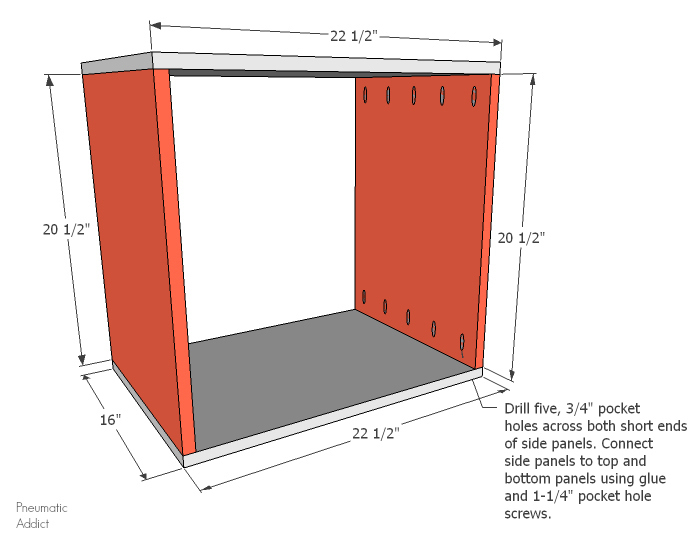 Apply glue to the ends, and attach side panels to the 22-1/2 x 16", top and bottom panels, using 1-1/4" pocket hole screws. 3. Measure opposite corners of the box to check for square. 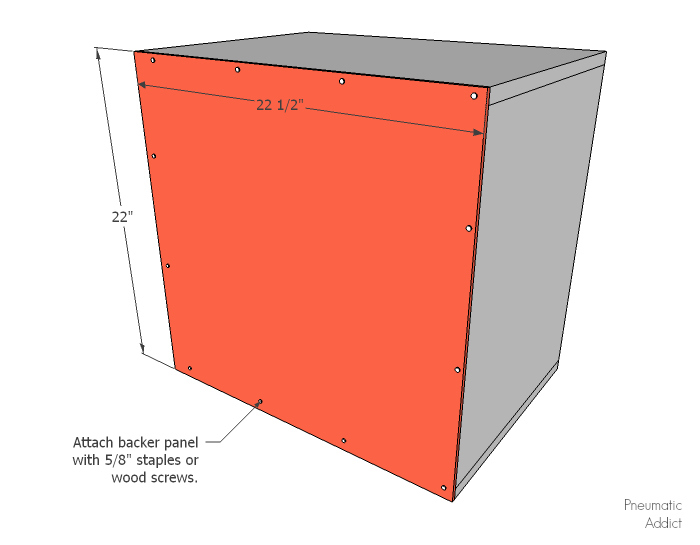 On the backside of the box (the side with un-banded plywood edges), align the 22-1/2" x 22" panel and attach it with 5/8" staples or screws. 4. With the basic body of the nightstand built, its time to start on the legs. 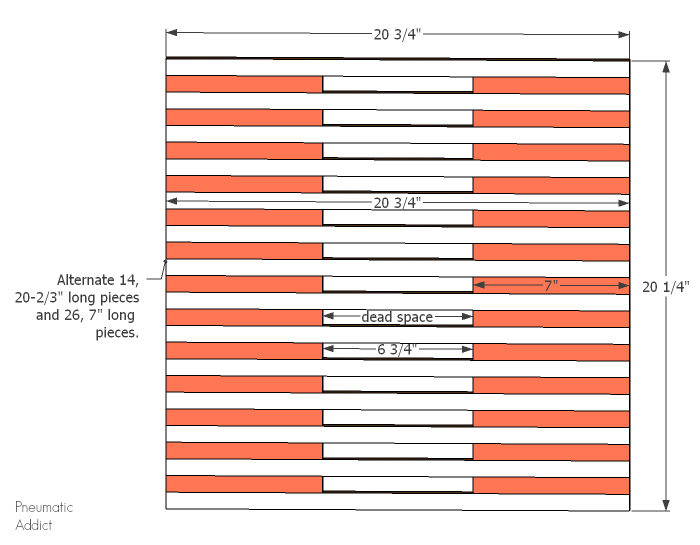 Cut two trapezoidal lengths of 2 x 2, 15 degrees off square, 12" long on the short side. Drill two, 1-1/2" pocket holes on either end of the short side. 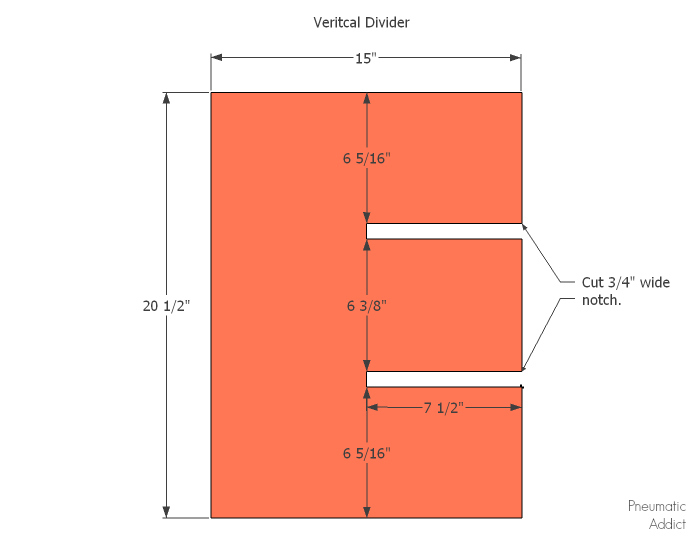 Cut four legs, both ends 15 degrees off square at 6", cut parallel. 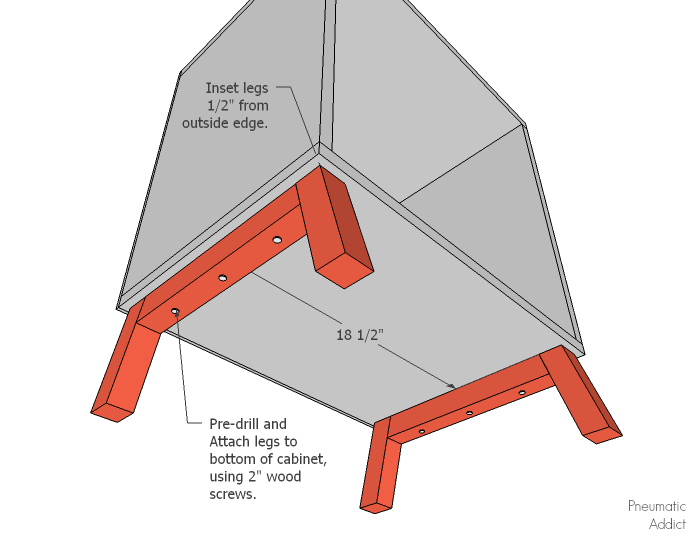 Apply glue to both ends of the center rail and align a leg on each side, flush to the top. Drive *2-1/2" pocket hole screws, joining the pieces together. 5. On the bottom side of the box, measure 1/2" from the sides. 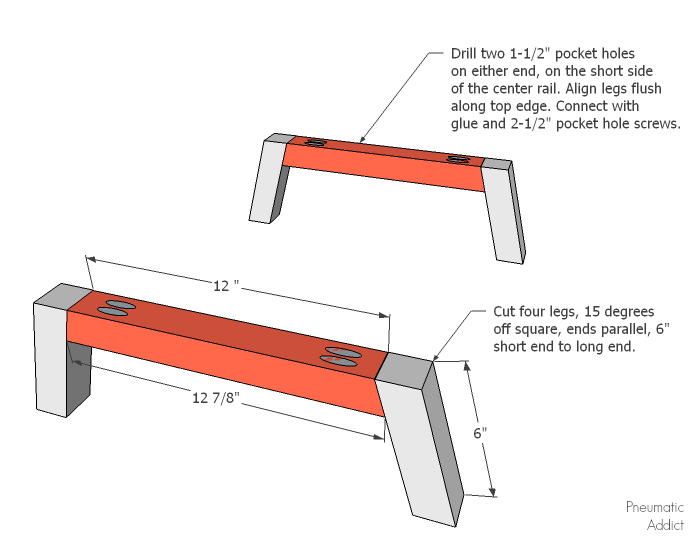 Place the legs and pre-drill three holes across the underside of the center rails. Attach to the box using glue and 2" wood screws. 6. 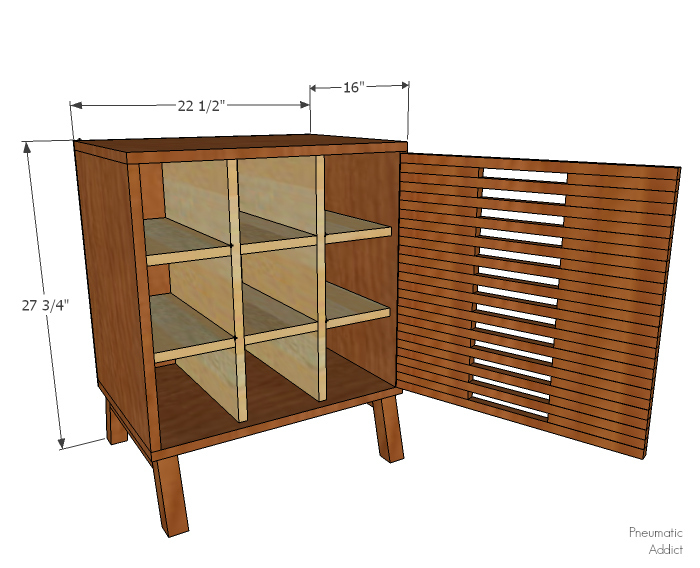 The four remaining plywood panels will become dividers for the shoe compartment. 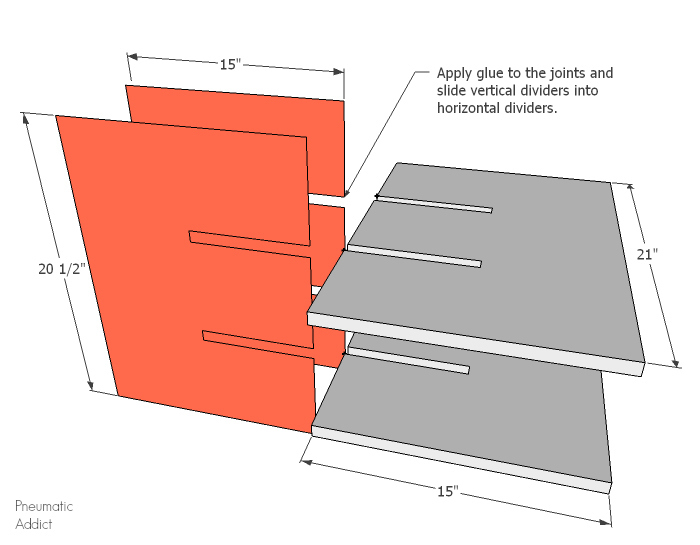 By cutting 3/4" wide notches into the plywood, the panels can be slid together (just like my 3D Plywood Trees). There are a lot of ways to cut notches. A router is traditionally used, but I came up another option. Mark the space where the notch will be cut. 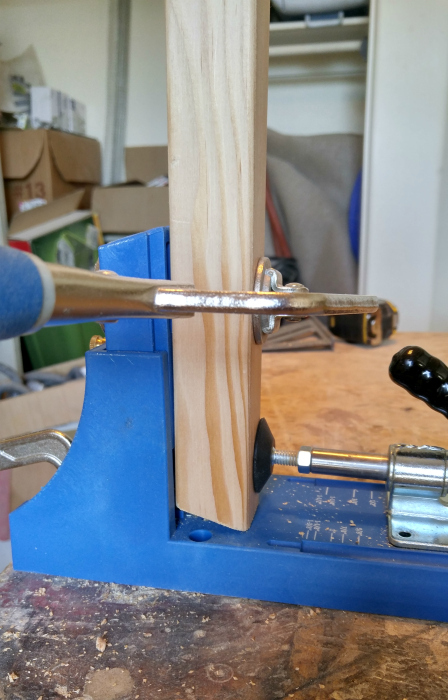 Next, use a 5/8" forstner bit and drill a hole at the end of the notch. 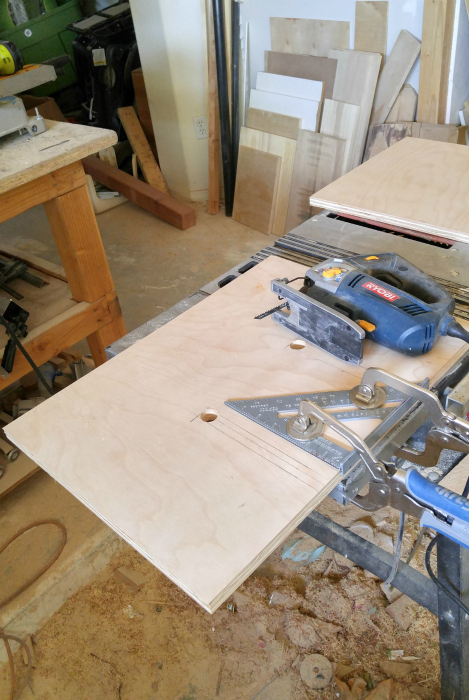 Then, clamp a speed square as a guide on the plywood, Use a jigsaw with a fine tooth blade, to cut out the marked space and square off the end. 7. Apply glue to the joints and slide the divider panels together. Clamp together and allow to dry. Once the dividers are dry, side them into the box. Pre-drill 6 holes through the bottom of the box, and secure in place with 2" wood screws. If the dividers are still a bit wobbly, you could shoot some 2" brad nails through the sides. 8. The last component to build is the door. 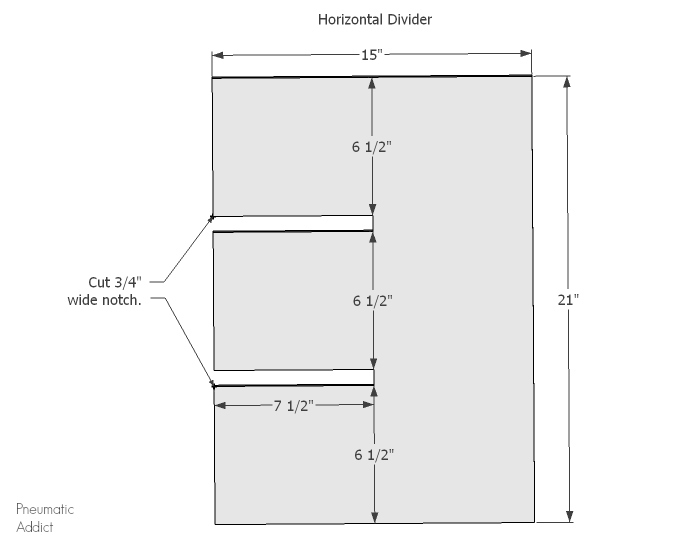 If you really love your table saw, you could cut down larger boards into 3/4" x 3/4" dowels. 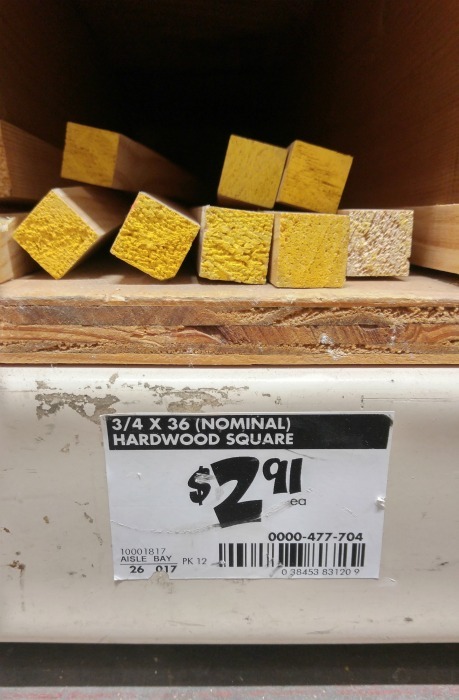 If you hate your table saw (like me), then you can find 3/4" square dowels in 36" length in the moulding aisle of Home Depot. 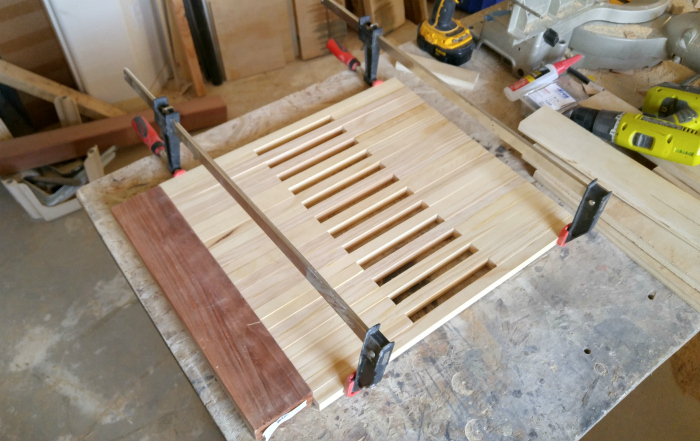 Since the door is made from so many pieces that are the same length, I highly recommend setting up a stop block on your saw or bench so you can make repeated cuts quickly. Working quickly, alternately stack 20-1/4" long dowel and 7" dowels, spaced 6-3/4" apart. Once in place, use a scrap block and a *speed square to line everything up. Clamp the boards together and wipe off access glue. 9. Once the door is fully dry, give all sides a good sanding, smoothing out any unevenness. This is when you would want to apply your stain and finish. The last step is to hang the door. Follow the directions included with the hinges. Depending on your hinges and how your door sits, you may want to install a magnetic catch. 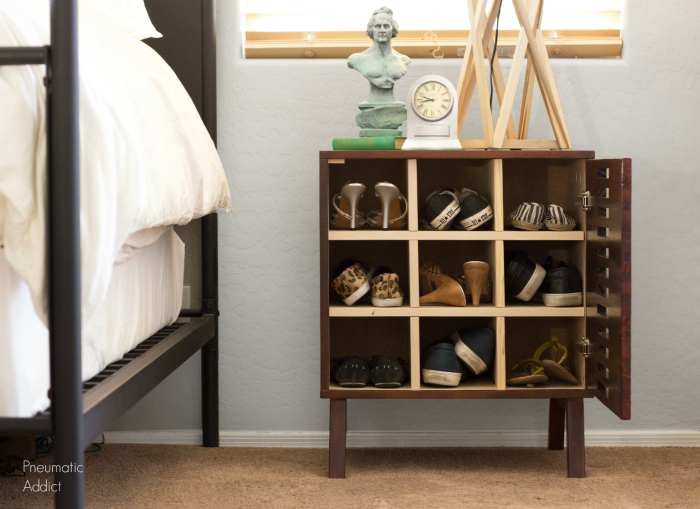 Fill up your new nightstand with shoes and you're ready to roll! I chose to leave the inside of the nightstand unstained. 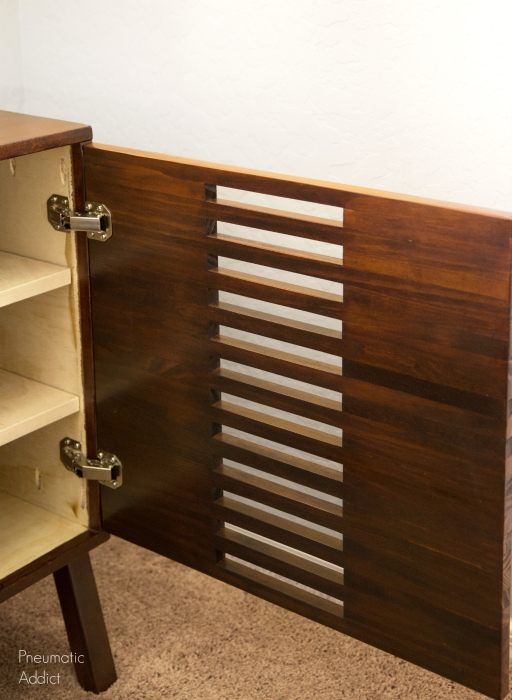 Knowing the inside of this cabinet would be housing dirty shoes, I wanted to protect the plywood. I brushed on 3 coats of *Behlen Rockhard Table Top Varnish . I absolutely love the way the door turned out! No hardware needed. Just reach in through a space and open it up. Although its made up from so many small pieces, it really was simple to build. *Note: I wish I had cut my doors slightly wide, maybe around 20-7/8" wide. By the time I squared up and sanded my door, it was a little narrow and left me with larger gaps on the sides. Like I mentioned, this nightstand is destined for my sons' room. Maybe they'll finally stop leaving their shoes on the floor? hahaha! Ready to get started? 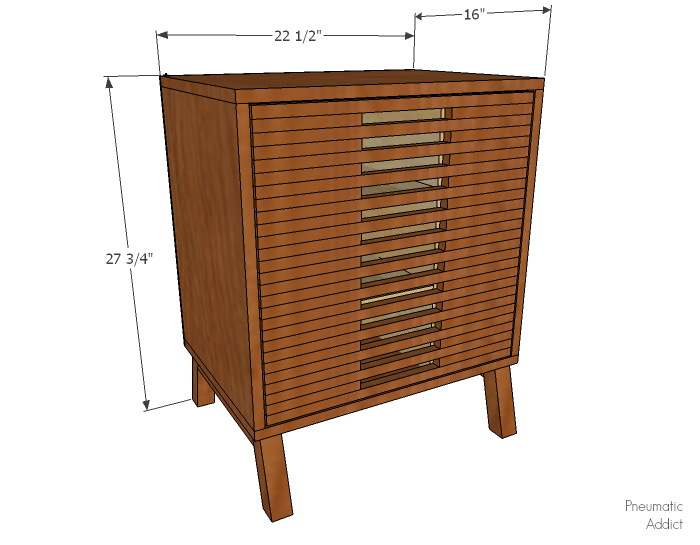 Head over to Mohawk-Finishing.com before starting your next finishing project and find the right product for just about anything you have up your sleeve. Feel free to pin the image below to save the idea for later! Thanks lady! I'm pretty happy with it. You're pretty awesome yourself! Great looking and I love the door! I have made what I call a Shoe Wardrobe out of an old TV armoire. They are good looking , plentiful and frequently free, now that the flat screen rage is on. It is pretty simple. I cut off the back section leaving a depth of 13". If there are drawers on the bottom I cut them down also. I attach a French cleat to the inside top and add shelves spaced at 4". Beautiful in any room in the house and can hold 60 pair easily. Thank you! 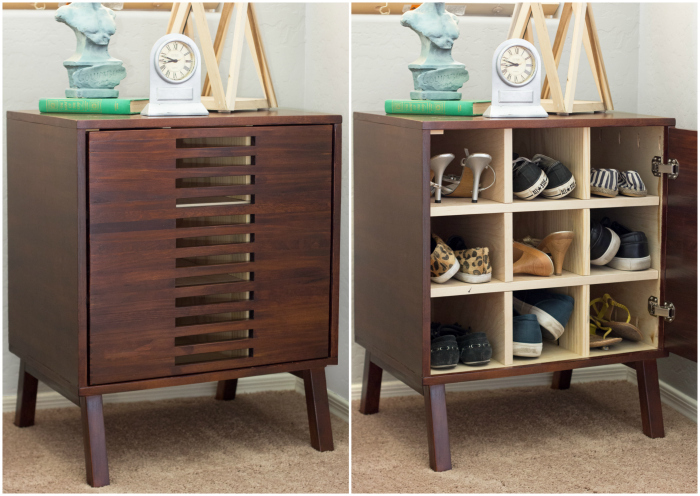 A shoe armoire is a a fantastic idea! Do you have any photos to share?